At Federal Signal, we operate with the highest principles and deliver results through customer focus, innovation, continuous improvement, teamwork and investing in our people. We do this not solely because it is good business, but because it is the right thing for our customers, employees, shareholders, and business partners. 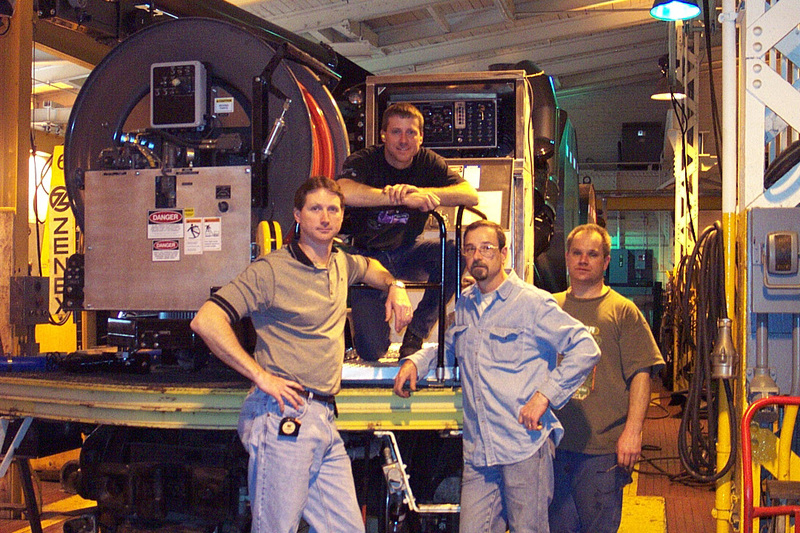 We employ more than 3,000 people throughout 14 principal manufacturing facilities in five countries around the world. We thoughtfully consider and continuously recognize the impact we make on the people of these communities and on the environment. Our vision is to be indispensable to our customers by consistently delivering products of the highest quality available in the market, providing training that reflects the importance of the safety of our customers and end-users and that protects the environment, and developing innovative products that deliver unparalleled performance and support sustainable energy sources. Our goal is to accomplish these objectives in ways that deliver value to our customers and shareholders. Implemented Infrared Oven for paint shop bake oven (a gas oven for curing paint but directs the heat at the metal and is more efficient in curing). Many of our Vactor and Guzzler products, including the Vactor HXX ParaDIGm (winner at the 15th annual Chicago Innovation Awards) promote safe digging practices. Safe digging allows for cautious excavation that avoids hazardous liquids, natural gas pipelines, telecommunication systems, electrical utilities, and sewer and water pipelines. These practices protect people, property, and avoid environmental damage. At our University Park location, where we produce most of our lights and sirens, there is a designated electronic vehicle parking space to promote the adoption of EVs. Through our innovative product designs, we blend the product performance our customers demand with critical safety features and proven energy efficiency that promotes a lower total cost of ownership. We dedicate significant resources to research and development, focusing on improvements to the efficiency of our products, all of which ease the reliance on fossil fuels. Take our relationship with NASCAR, for example. In its second year as a NASCAR partner, the Elgin Crosswind Specialty Track Sweeper, or NASCAR’s Green Sweeper, is a major part of making NASCAR races function smoothly, all while doing so in a sustainable manner. From conditioning the track prior to events, to cleaning up debris after incidents, to sucking up the water shed from the racing surface by the Air Titan, the Elgin Crosswind Specialty Track Sweeper is making a lasting impact on NASCAR. Elgin Sweeper uses a proprietary shared technology system to run the Crosswind Specialty Track Sweeper more efficiently, which uses less horsepower and saves fuel. The vehicle features a two-engine system, with the sweeper featuring a John Deere diesel engine. Both the chassis engine and the sweeper engine are powered by a B20 biodiesel blend of fuel. “We’re basically using formerly wasted energy from the chassis engine and diverting it back to power the sweeper itself,” explains Mike Higgins, vice president and general manager of Elgin Sweeper. “It’s really been a great innovation for us. We’re using anywhere from 12 to 16 percent less fuel than we would normally. That’s quite of a bit of savings when it comes to your overall carbon footprint.” In figuring out how to use wasted horsepower from the chassis engine to power the sweeper engine, Elgin has been able to use a lower horsepower sweeper engine and increase fuel efficiency across the board. By diverting the energy, the Crosswind Specialty Track Sweeper saves roughly one gallon of diesel fuel per hour, which relates to about 22.4 pounds of CO2. Over the course of a NASCAR season, this technology offsets about 16 metric tons of CO2 being put into the environment, or the equivalent of planting 372 new tree seedlings. 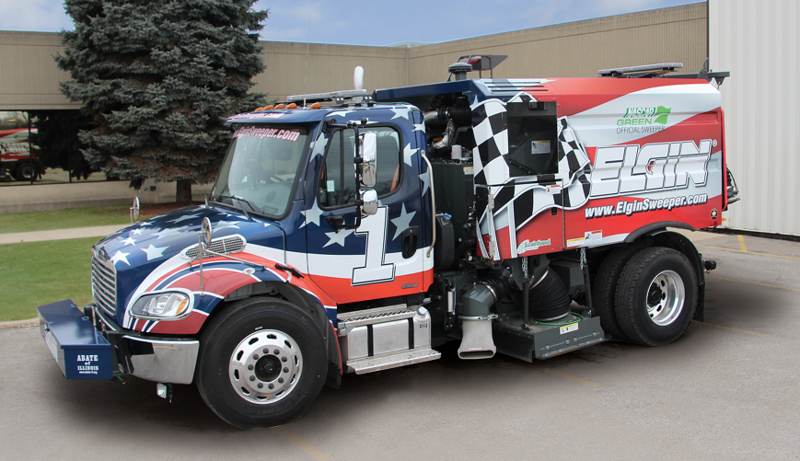 While the Elgin Crosswind Specialty Track Sweeper is specifically designed for use on racetracks, the green lessons learned in NASCAR are being applied to the product that is seen on streets and highways across the country. 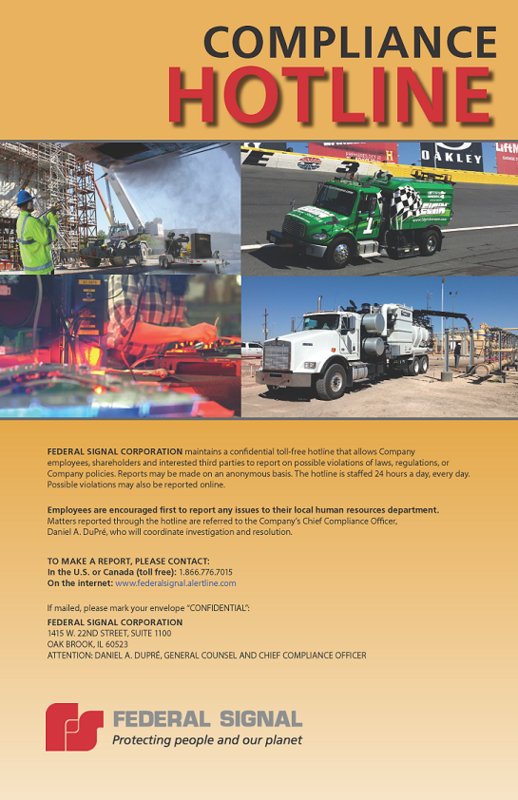 Federal Signal is committed to protecting the health and safety of our employees, customers and end users. We actively promote a culture in which we continually train employees on health and safety best practices with the goal of zero work-related injuries. The well-being of our employees is vital to our continued success. We seek opportunities to promote safe work environments for employees in every job, and support their health by offering competitive health insurance benefits and promoting wellness programs. Employees are also encouraged to continue their education through company-sponsored tuition assistance programs. Federal Signal’s Code of Conduct applies equally to all employees and our Board of Directors. The Code of Conduct provides guidance for ethical decision-making and outlines our responsibility to abide by the law. The Code of Conduct touches on many topics and is enhanced by separate policies we require employees to acknowledge, including policies covering Anti-Bribery and Anti-Corruption, Environmental Matters, and Anti-Discrimination policies. In addition, we expect our suppliers to acknowledge a Supplier Code of Conduct which prohibits bribery, corruption, and forced labor, and requires suppliers to abide local health, safety, and environmental standards. Federal Signal Corporation seeks to support a variety of community and charitable organizations where our employees live and work. The Federal Signal Corporation Give Where You Live Matching Gift Program is designed to encourage employee charitable contributions through a Company match of all or a portion of employee donations to qualifying organizations. Federal Signal Corporation is proud to sponsor the Karl F. Hoenecke Memorial Scholarship program for dependent children of employees of Federal Signal and its subsidiaries. Eligible students will be current high school seniors or the international equivalent final year higher/upper secondary students who plan to enroll in a full-time undergraduate course of study at an accredited two-year of four-year college or university. This program was established in memory of Karl F. Hoenecke, Chairman of the Board of Federal Signal from 1975 to 1987. Mr. Hoenecke, who died in December of 1987, was an outstanding business and civic leader. He appreciated the value of a quality education in the development of future business leaders. We believe Karl’s, and Federal Signal’s, high regard for education will be fostered through this program. Federal Signal is dedicated to maintaining the trust of our customers, employees, shareholders and members of the concerned public, and strongly believes in continually improving our processes. That is why we maintain an anonymous Compliance Hotline that allows Company employees, shareholders and interested third parties to report on possible violations of laws, regulations, or Company policies. Please see our website for details.